Following info is adapted from here. Another site with a similar instruction. If you do not have the software and drivers, a vender from amazon provides a link for download. The Techstream version 12* and above should be compatible with Windows 10 64 bit system. Installed and follow through instruction. copy Mainmenu.exe in Bin folder under installation folder. start Techstream and input registration code. 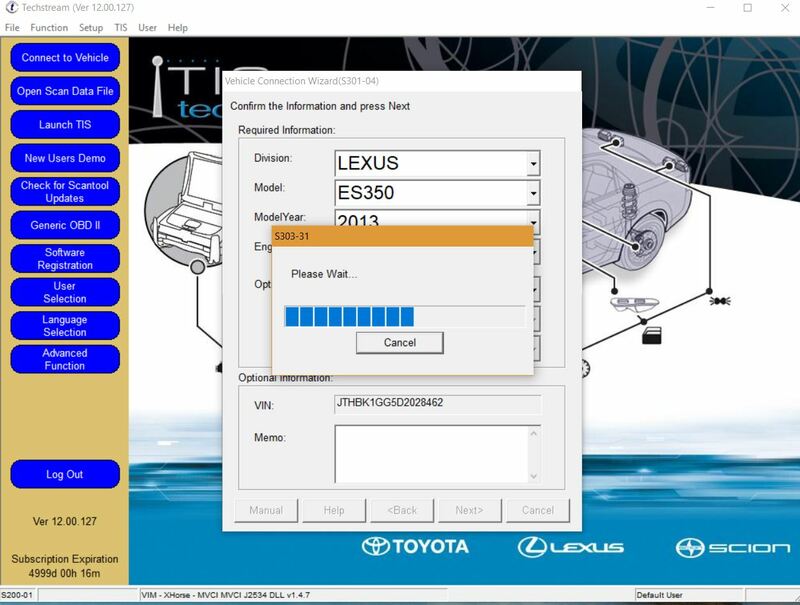 unzip the MCVIDriver.msi, move the contents under “C:\Program Files (x86)\XHorse Electronics\MVCI Driver for TOYOTA TIS”. plug in mini VCI cable. Open the Device Manager the device should be loaded. If not, right click each failing device, select Install Driver, then ”Browse my Computer” and locate to “C:\Program Files (x86)\XHorse Electronics\MVCI Driver for TOYOTA TIS” (enable the ”include subfolders” flag). Click ”Next” and wait until drivers are installed. You should now see two new devices: ”Universal Serial Bus Controllers\USB Serial Converte” and ”Ports (COM & LPT)\USB Serial Port (COMx)”. 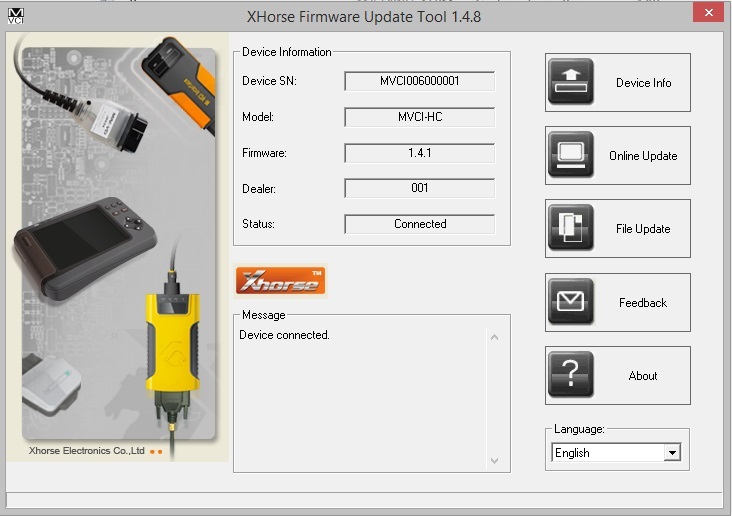 Run the FirmwareUpdateTool.exe from the “C:\Program Files (x86)\XHorse Electronics\MVCI Driver for TOYOTA TIS”. Click ”Device Info”, You should see the ”Device connected” screen. Attention: It’s C:\Program Files (x86) not C:\Program Files\ , BIG DIFFERENCE !!! Connect Mini VCI cable to your car‘s OBDII interface, turn ignition on, then click ”Connect to Vehicle” in Techstream. Wait. Then wait again. 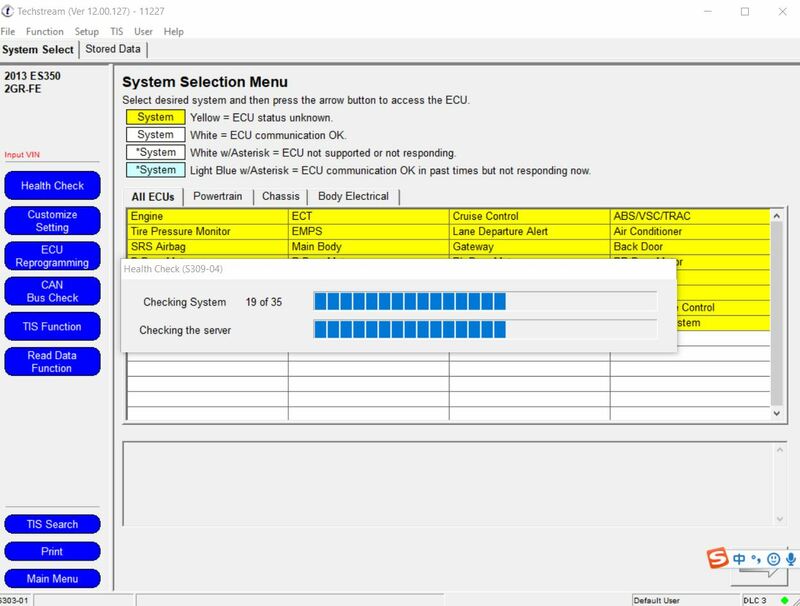 If everything works, you will be prompted to confirm car year/model after which you’ll get to the diagnostic interface.